UPDATE, December 4 : We have selected the final cast for the game, please check our updates section for the full announcement. Thank you to all the people who sent their auditions for your time and excellent work as well as for your interest and enthusiasm for our project. We are really humbled by the amount of people who auditioned and gave support and kind words towards our work. 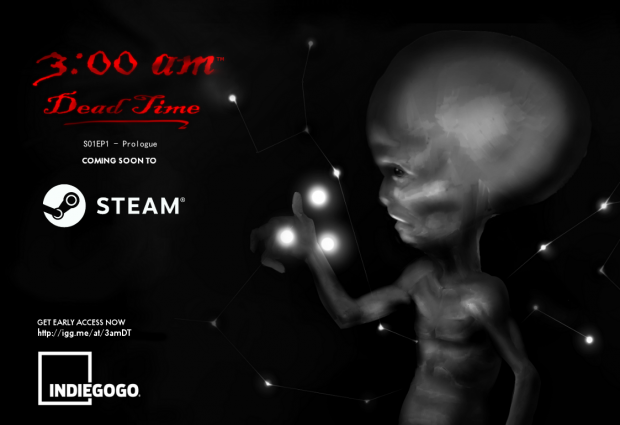 We are Irreverent Software, a very small indie games team working on an upcoming horror game for PC whichwill soon be available through Steam Early Access.The name of the project is3:00am Dead Time. In the game, players play as paranormal investigators travelling around the world researching the scariest, deadliest and most mysterious events for a TV show. 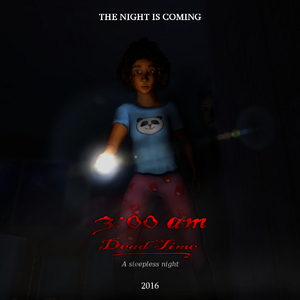 Following the TV show format, the game is split into 6 different episodes, and we need the help of several voice actors and actresses for the different roles, as the game is heavily based on a storyline and highly cinematic. Due to the very reduced budget of this game (as we are funding it on our own) and the limited resources of our team, this voice acting job will be for credit and experience only. Every voice actor / actress will be fully credited in a highly visible manner in the opening credits of each episode and their promotional trailers (for the main and secondary characters) as well as in the end credits of each episode (for smaller roles). Besides this, the voice actors and actresses will receive a free copy of the game as our thanks. * Collins. Male, american (slight southern accent preferred), 35 years old. Secondary role, one episode. * Female newscaster.Small role, 30-40 seconds, may be asked to return for further small roles. * John, male, 30 years old. Secondary character, 6 episodes. *Sheriff - American man, 50 years old. Secondary character, one episode. Southern accent will be preferred. * Michael, American man, around 45-50 years. No accent, but a deep / low voice is preferred. Secondary character. He is very important in the story, thus the performance, the right display of the emotions, sarcasm and wit will be the most important factor while reviewing the audition. *NOTE : This character is the satanism / occultism expert, and as such his view of the world, opinions and dialogues will touch topics on religion, atheism, paranormal rituals and methods, etc. Be sure you don't have troubles performing these kind of dialogues before auditioning for this character. In this link you can find a text file with a test dialog for each one of these characters. If you are interested in collaborating with us, please send us your best voice performance test with the lines of the character you are interested on to [redacted] with the subject line“Voice acting test for 3:00am Dead Time”, or send the censored version through the usual audition process using the buttons below, with the character names. Everyone is welcomed to send their Voice acting demo(s) regardless of experience level, but we do ask you to send your audio files in the cleanest way possible, without background noise / artifacts as this would affect negatively the atmosphere and final audio quality of the game. If you are not in the age range of any of the above characters feel free to send your voice test anyway, as your voice may still suit the character or some other small roles. If you have any questions or doubts, leave a comment or contact us via email / twitter (irrsoft/ 3amdt), and we will do our best to solve them all. African american female, no accent required. 24 years old, skeptic, brainy kind of girl. Serious but with several sarcastic / mocking dialogues. Several emotions will be required in the performance. (*SCARED, TALKING IN WHISPERS TO ANOTHER CHARACTER) How are you so sure there's no one else in here? (*PAUSE, THEN WHISPERING IN AN ANNOYED /INCREDULOUS MANNER) A feeling?! You have a feeling?! YOUR FEELINGS ARE GOING TO GET US KILLED! American male, 26 years old, no accent required. He is a very active person, loud at times, very expressive and talkative. A good emotional range will be required for this performance. (*ACTIVE VOICE, CONFIDENT) The witness you are going to interview is going to meet with you later today. Film everything, don't mess around, and bring me good material. (SLIGHTLY CONCERNED) Be careful though...you have a long day ahead. American man, 50 years old. Secondary character, one episode. Southern accent will be preferred. (*UPSET,BUT STILL TALKING CALMLY) I don't appreciate the Feds coming here and telling us what to do. This town has been peaceful and calm all my life. (*SHORT PAUSE,THEN CONTINUES WITH SLIGHT ANGER IN HIS VOICE) By God it'll keep that way as long as I'm here. (*ADDRESSING THE PLAYER, WITH CONVICTION) I want you to go to the house and make everything public. There's something fishy in all this. American male, 35 years old. Slight southern accent. Had a troubled recent past, and should be able to show a range of emotions, from anger and fear, to depression. Priority casting. No, I have already told you that. My back was hurting, my eye felt on fire... five days had passed, I was three hundred miles away from the McCarthy's... (*ANGRY AND CLEARLY TIRED, HE HAS EXPLAINED THIS MANY TIMES) AND I DONT HAVE A CLUE OF WHAT HAPPENED! American female, no accent required. 21 years old, student. A relaxed, centered type of person. Slightly bossy attitude at times. A good emotional range will be required for the performance. Hispanic american character (natural Hispanic accent preferred, but not required). 38 years old. Slightly skeptic, professional veterinary, as the oldest member of the team and sort of a mentor at times, a more calm range of emotions will be required. American female, no accent required (New York accent preferred). 19 years old. Happier, active kind of person, but easily scared. Several emotions will be required in the performance. Do you think it's true? What he said, about that boy. Do you think he is really dead? (*WITH SLIGHT FEAR, SLIGHT PESIMISM) If it's true...then we are screwed. Michael, the Satanism / Occultism expert. American man, around 45-50 years. No accent, but a deep / low voice is preferred. Secondary character.He isvery important in the story, thus the performance, the right display of the emotions, sarcasm and wit will be the most important factor while reviewing the audition. *NOTE : This character is the satanism / occultism expert, and as such his view of the world, opinions and dialogues will touch topics on religion, atheism, paranormal rituals and methods, etc. Be sure you don't have troubles performing these kind of dialogues before auditioning for this character. (*SLIGHTLY ANNOYED, LIKE EXPLAINING TO A STUBBORN KID) The rituals and the words have no meaning. (*USING A MOCKING /DISMISSING TONE) You can believe whatever you want, lady, because that creature and I have something in common. We don't give a s***. I could be invoking unicorns and fairies for all I care. (*GAINING MORE CONFIDENCE, HE BELIEVES WHAT HE SAYS) The intention, the conviction is what matters. The energy I display. (*A LITTLE SLOWLY, AND JUST SLIGHTLY THREATENING).And if you want us to help him...then you better let me do my work.